At the end of April, Geauga County waits in anticipation for the start of the Maple Festival. 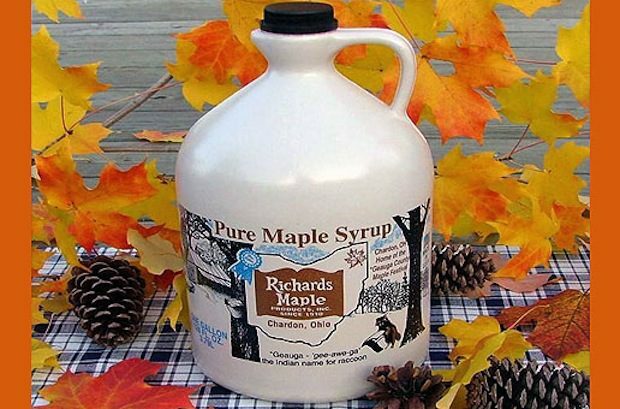 One of the leaders in our maple syrup industry is Richards Maple Products. Established in 1910, Richards is celebrating 101 years in business which began when Will and Rena Richards started a small farm on Clark Road, just north of Chardon. The stately maples that the county boasts proved to be a goldmine of sap – just what this pair needed to produce rich, golden syrup. With four full time employees and two to six part time employees, they are bulk buyers and packers of pure maple syrup, produce maple candy and confections, and sell equipment for making maple syrup. Richards begin their year by selling the equipment needed for producing maple syrup. In the spring, they will then buy maple syrup off numerous local producers. The money they earn from their resale of the syrup is often used to buy seed and fertilizer to begin the planting season. Many consumers visit their store in the spring to purchase the fresh maple syrup. Being a part of the March Maple Madness Driving Tour brings consumers to them where they observe how pure maple syrup is made. 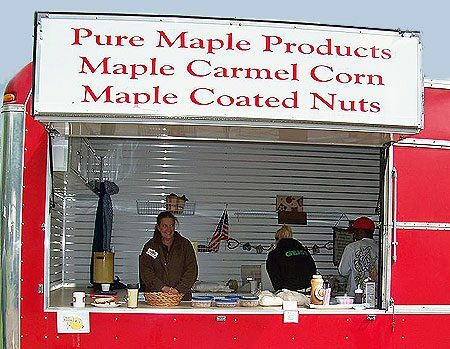 They end their spring with the Geauga County Maple Festival where they sell maple products, provide maple syrup for their pancakes, and wholesale to the Chardon Kiwanis Club, so they, in turn, may resell as a fundraiser. May, June, and July are slower months. But towards the end of July, maple candy, maple caramel corn, maple barbeque sauce, maple mustard, and many other maple products are made to take to the Ohio State Fair which kicks off Richards’ fair season and takes them into October. After fair season, they begin to get ready for the Christmas season. Thousands of gifts are shipped all over the United States and throughout the world. Richards’ products have won awards at the Ohio State Fair, Geauga County Maple Festival, Geauga County Fair, and other Ohio County Fairs since William and Rena Richards started exhibiting and selling products in the early 1930’s. Second generation owner, Paul S. Richards, has been inducted into four different “Hall of Fames” and boasts many recognition plaques for his years of service or participation. Third generation owner, Debbie Richards, was inducted into the Geauga County Maple Hall of Fame in 2004, won the Charles Keiter Award from the Ohio Maple Producers Association, and is a Past President of the International Maple Syrup Institute. Fourth generation Jen Freeman is past President of the Ohio Maple Producers Association, member of the North American Maple Syrup Council, Vice President of the Geauga County Maple Festival, and the anticipated fourth generation owner. The fifth generation is still in training! Upon entering the store, your eyes are dazzled by all the sweet treats that are offered! To promote the use and health benefits of Pure Maple Syrup and Maple Candy. If you are a Chardon regular, just stopping through for a quick visit, or perhaps visiting this weekend for the Geauga County Maple Festival, be sure to stop in and sample some of the fine products this long time county business has to offer. Your palette will thank you! Richards Maple Products is located at 545 Water Street Chardon, Ohio 44024. For store hours visit their website and also like them on Facebook.